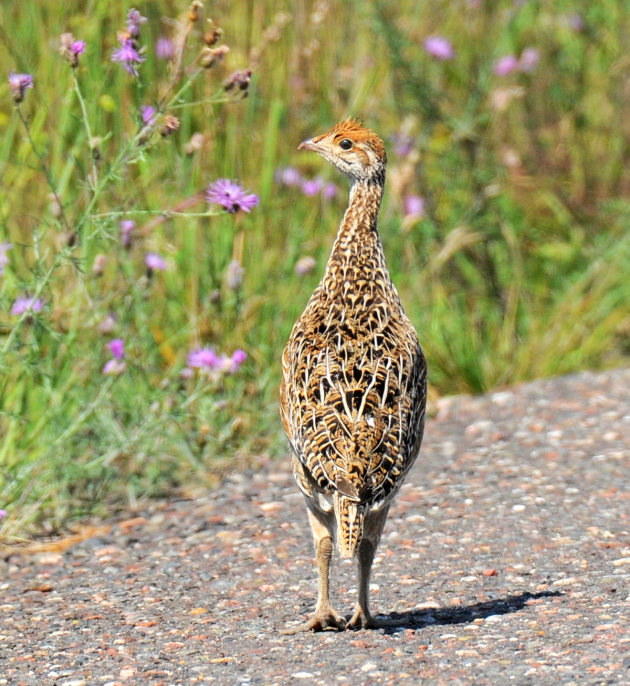 Sharp-tailed Grouse were resident birds for years at Crex Meadows wildlife area north of Grantsburg, Wis. This was the close place to the Twin Cities to see these birds. Then, no more. The population dwindled and disappeared. Last year they returned, perhaps from a population in the Namekagon Barrens Wildlife Area. (That area is essentially in the middle of nowhere, but east of Wisconsin Highway 35 and north of Highway 77. Maps can be found with Google.) Anyway, the grouse were seen at Crex last year. 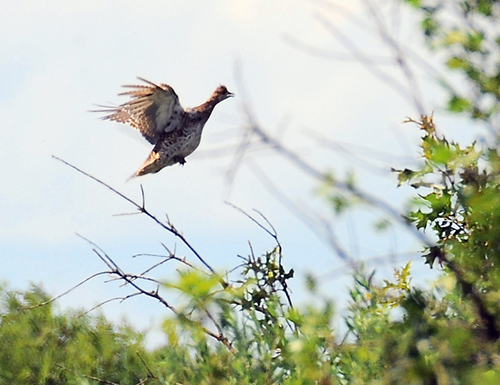 A half dozen males were seen on a lek this spring, courtship showoffs. Wednesday of this week a grandson and I saw a Sharp-tailed family along East Refuge Road in Crex. There were perhaps a dozen chicks (they get into the brush quickly), and one adult. It, probably she, posed for photos before taking flight. These are beautiful grassland birds. You can see the pale strips of grass on this bird's back, part of its cryptic coloration.